Located just 40 mins drive from your cottage at Fuchsia Lane Farm you will find the wonderful wilderness and sculpture park, Lough Boora Discovery Park, located between Cloghan and Birr, Co. Offaly. 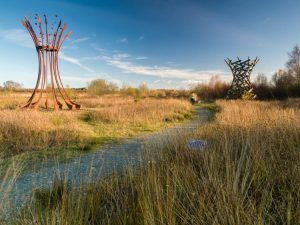 The park is an innovative environmental project created in an old bogland and consists of walkways, cycleways, an outdoor sculpture park and visitor cente with cafe and bicycle hire. It is a wonderful place for people of all ages to enjoy nature, get out in the open air and experience some unique flora and fauna that can be found in a cut away bogland. The uniqueness of this place was recognised recently when it was named the winner of Royal Town Planning Institute Ireland RTPI Ireland’s Best Places competition. This nationwide competition, organised by the Royal Town Planning Institute Ireland, celebrates the places protected, planned or improved by town planners for communities. Lough Boora Parklands attracts some 100,000 visitors a year. Once an industrial peat bog, its transformation includes the creation of a nature reserve maintained by the Irish Wildlife Trust that aims to ensure its natural resources and biodiversity remain for generations to come. You can be one of these people!